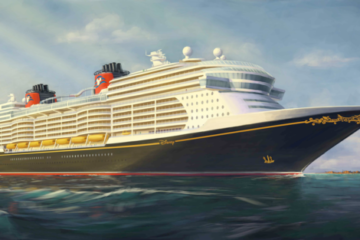 The Disney Cruise Line vessels are modern marvels. 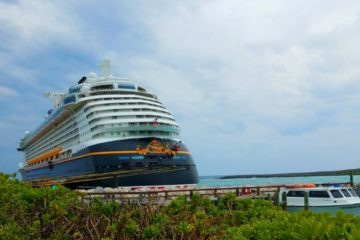 They offer all of the amenities you would expect of a luxury ocean liner, but they also have a touch of the past. As the old adage goes (and I paraphrase), you can’t get to where you’re going unless you know where you’ve been. 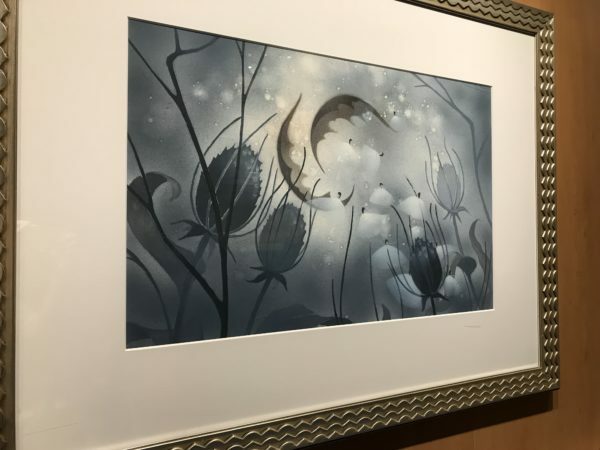 Let’s take a look at some of the art on the Disney Dream. 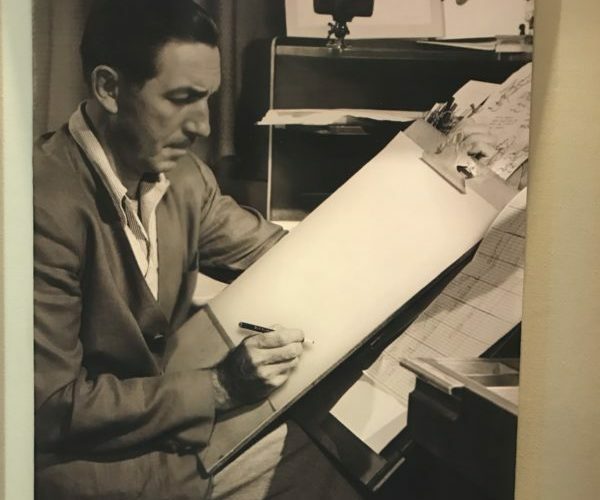 Walt was actively involved in the animation of the early movies. 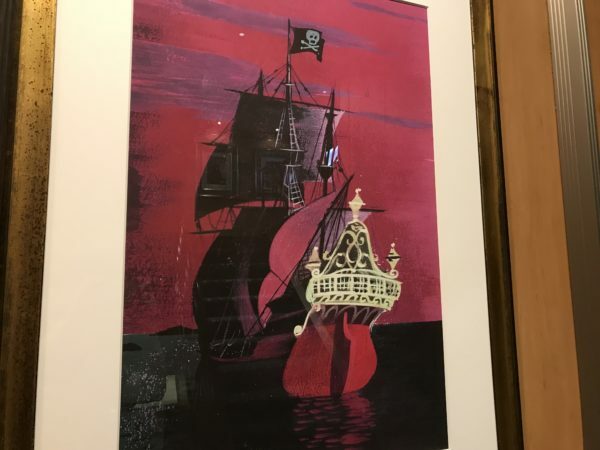 Disney pay tribute to its history, and has adorned all of their ships with beautiful concept art and storyboard drawings from some of their earliest movies. 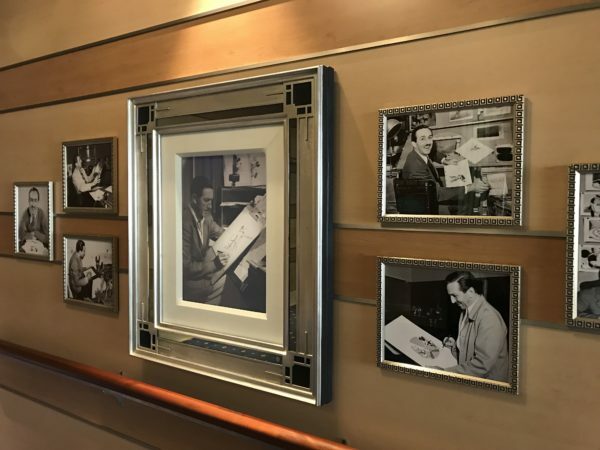 There are also some pictures of Walt Disney himself. 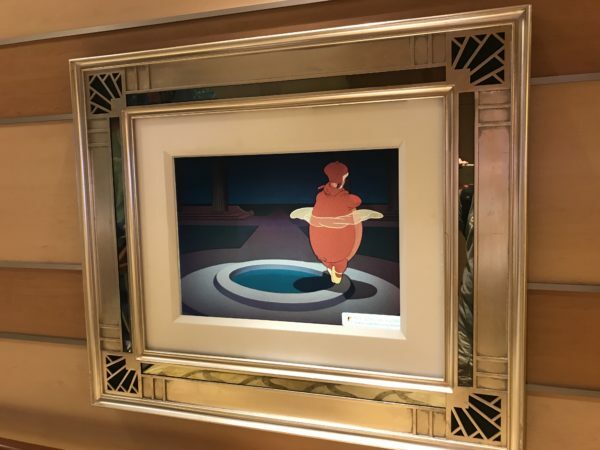 Most of the artwork appears in public places like stairwells, near elevators, and in the corridors of the ship. 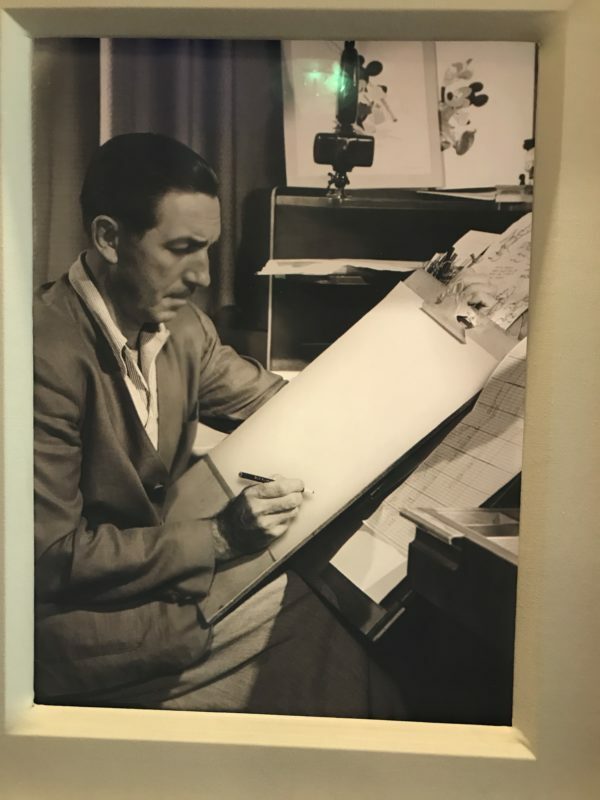 These photos show Walt working on his animations! 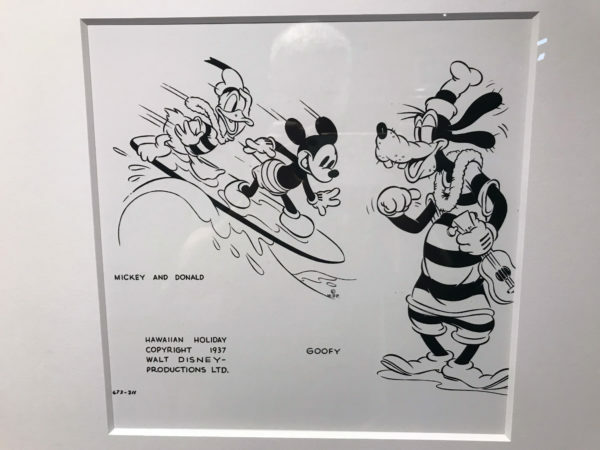 Besides full-length feature films, Disney also created many short films, or shorts. They were usually only a few minutes long and were quite dramatic and entertaining. “Hawaiian Holiday” (1937). 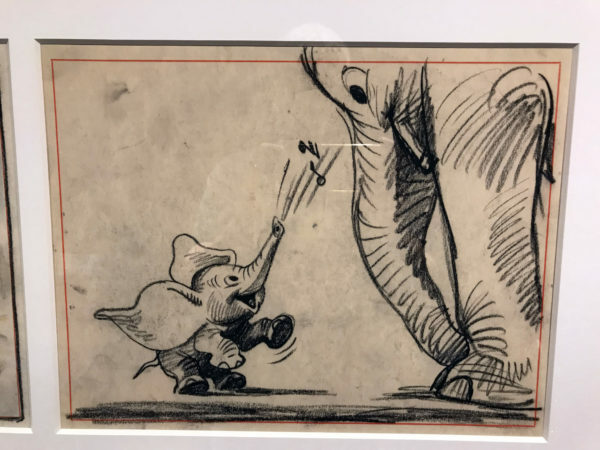 Concept sketches created for the Disney short. 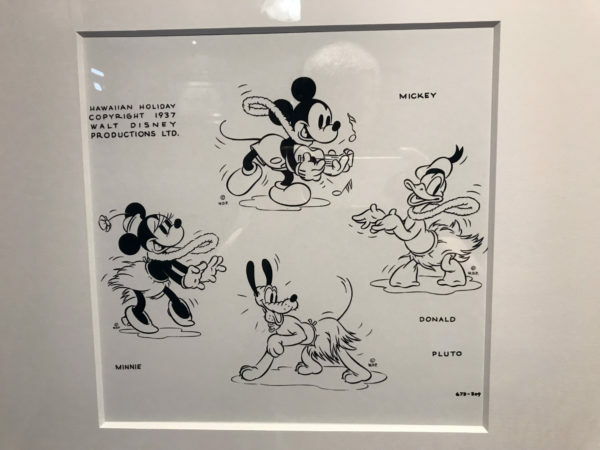 These sketches represent character studies designed to explore poses and concepts for the Disney animated short. 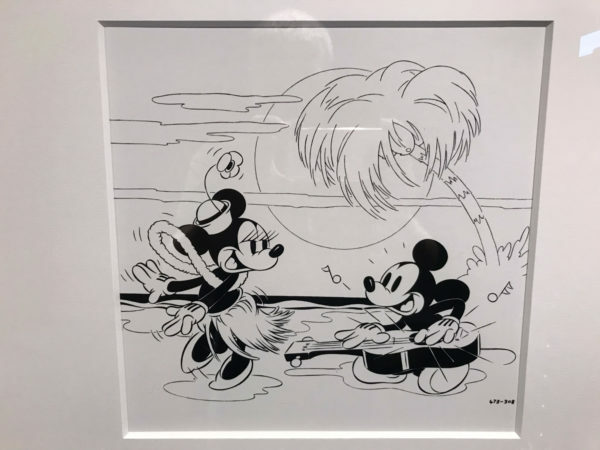 Hawaiian Holiday was created in 1937 and starred Mickey Mouse, Minnie Mouse, Pluto, Donald Duck, and Goofy, who later became known as the Fab Five. At the time, Hawaii had not gained state status, and was just a territory of the United States, but it was famous for being a vacation destination. In this film, the Fab Five vacation in Hawaii. 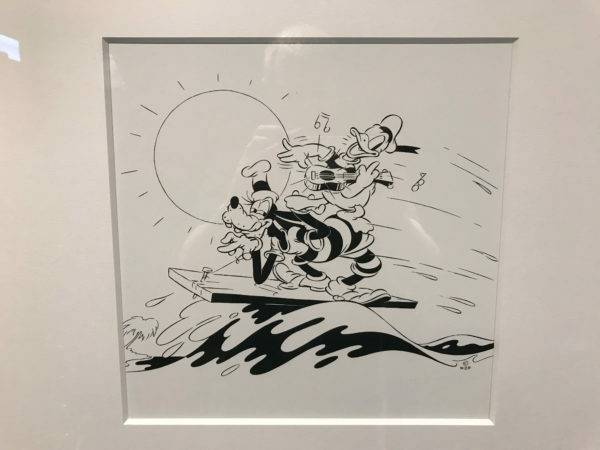 Minnie takes hula dancing lessons, Mickey plays a slide guitar, Donald picks a ukulele, Pluto chases ocean waves, and Goofy tries out surfing. 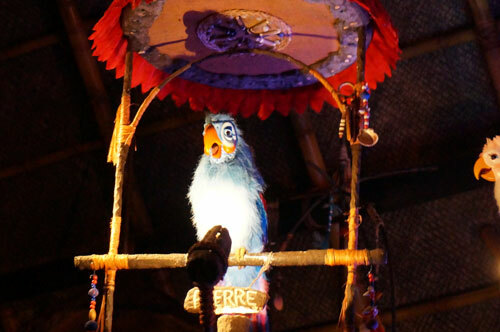 The drama comes when a wave starts to run back at Goofy who hits his head on a rock and gets stuck in the sand. 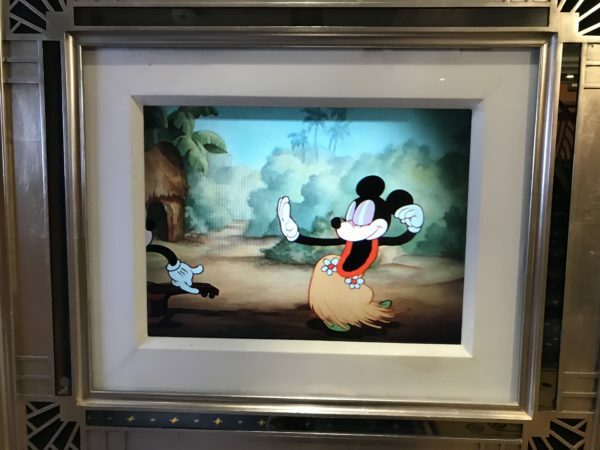 Mickey then has trouble with his guitar, and Donald and Minnie switch places with hilarious consequences resulting in Donald catching his grass skirt on fire. The gags ensue, and they all experience some misfortune. In the end, they all enjoy the vacation. 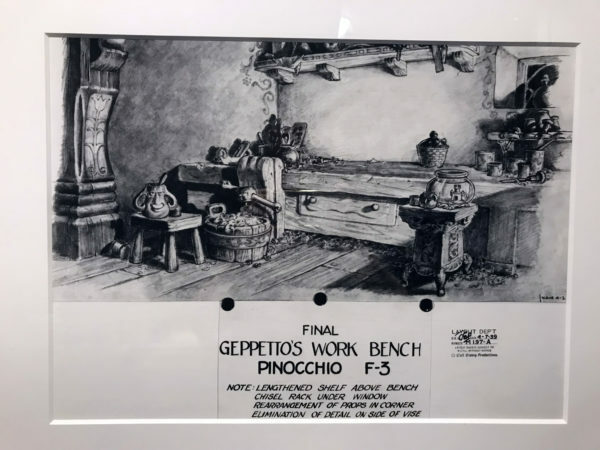 Pinocchio (1939) retells the age-old story of an Italian wooden toy carver who longs to have a child. He carves Pinocchio and wishes that he’d come to life. When he actually does, Pinocchio must learn how to be a real boy with a little help from his conscience, a cricket named Jiminy Cricket. 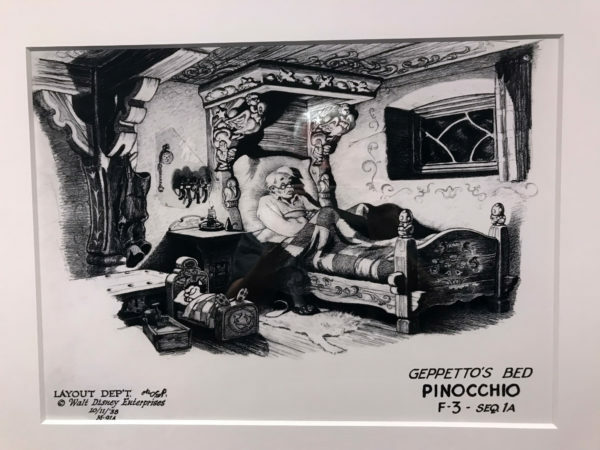 “Pinocchio” (1939). Concept sketches created for the film. 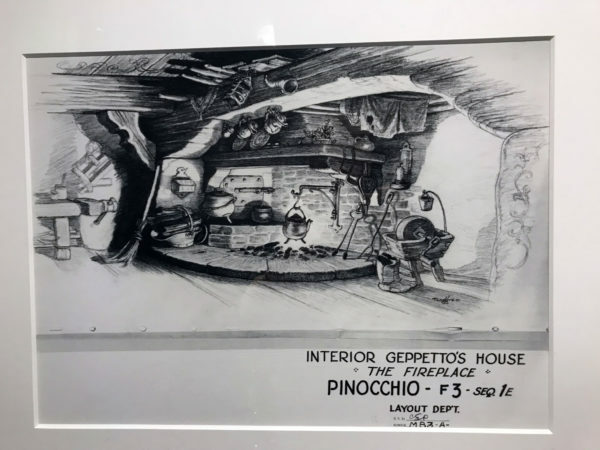 Before final artwork is created for an animated film, concept sketches, like these for Pinocchio, are drawn to convey the basic design and mood of a scene. 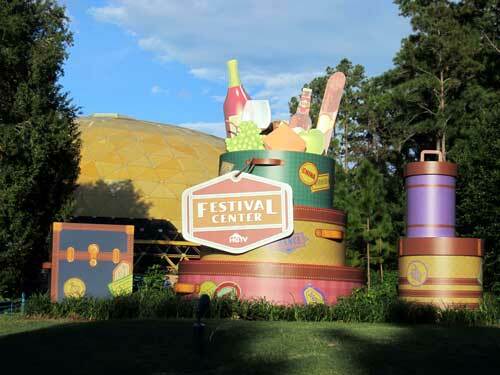 Fantasia is unlike any other full-length animated feature produced by Walt Disney Productions. Instead of one integral story, it consisted of eight segments set to classical music. “Fantasia” (1940). 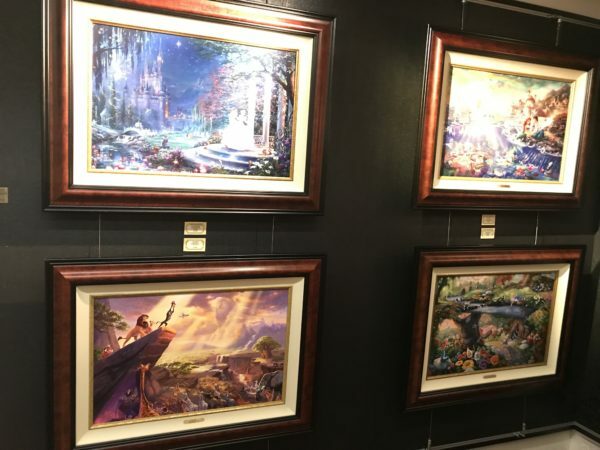 Concept art for the film These paintings represent key moments from the nutcracker suite segment of the musical animated feature. Film critics loved the movie, but WWII cut off distribution to European markets. That combined with high production costs and the expense of leasing theaters with or installing the proper equipment caused the film to suffer in profit. Nonetheless, Fantasia is the 22nd highest grossing film of all time in the US when adjusting for inflation. 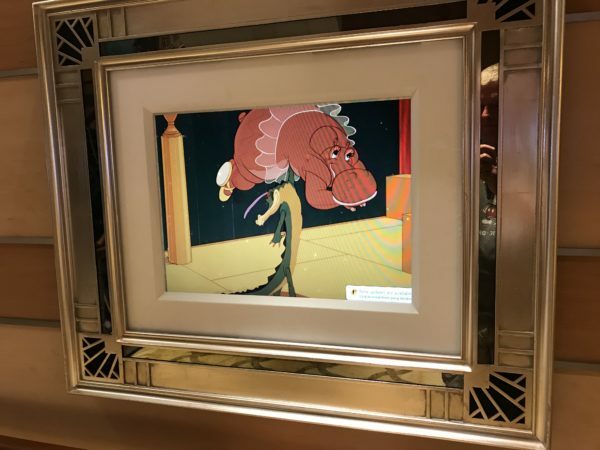 Fantasia ranks fifth on the American Film Institute’s list of top ten animated films. 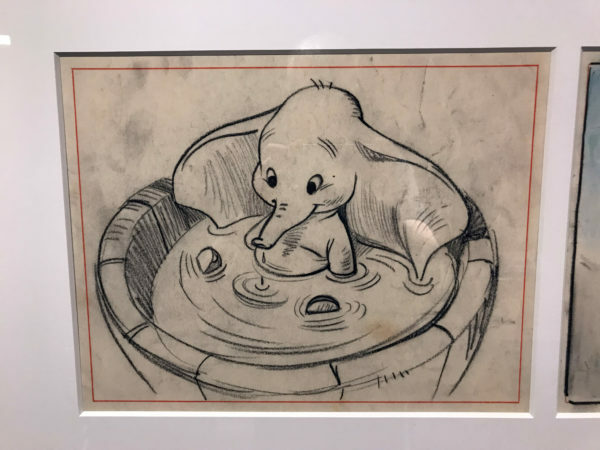 Dumbo (1941) was Disney’s fourth animated feature film and was created to make up for the financial loses of Fantasia. 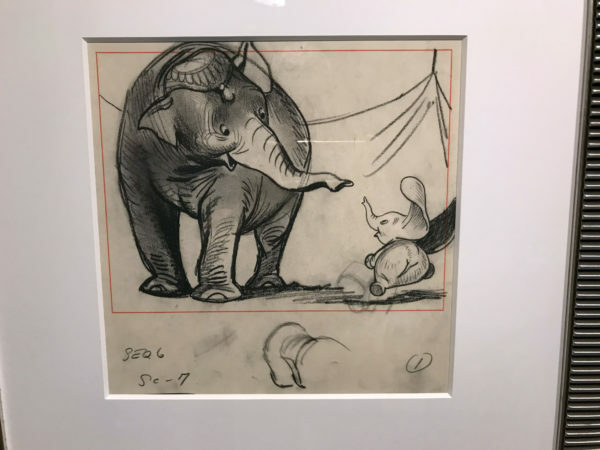 “Dumbo” (1941). Storyboard Drawings for the film. Storyboard Drawings are used by filmmakers to pre-visualize a story from start to finish. 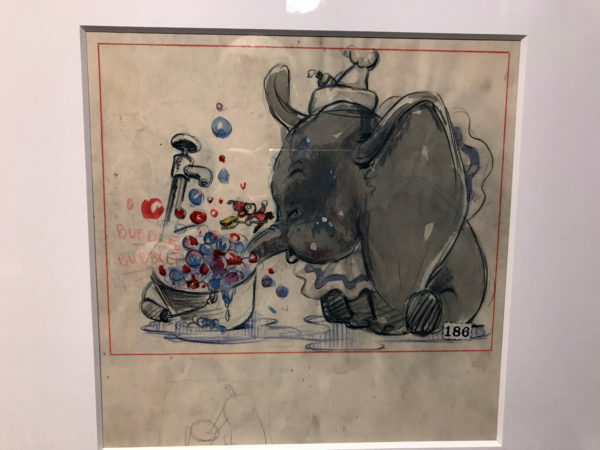 The main character is an elephant named Jumbo Jr., but he’s earned the unfortunate nickname of “Dumbo” because he wasn’t considered very smart. 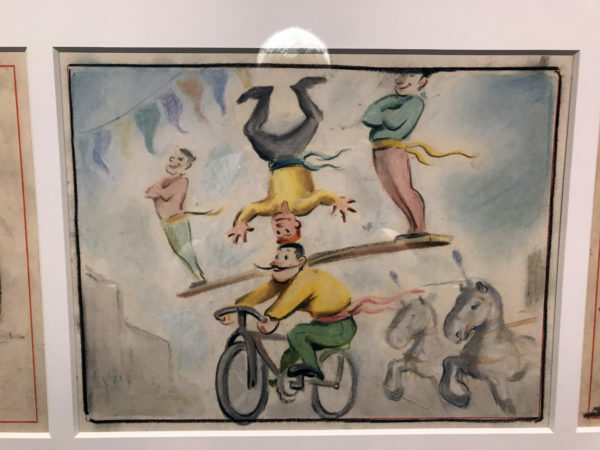 He had very large ears, so the other circus animals thought he looked funny. 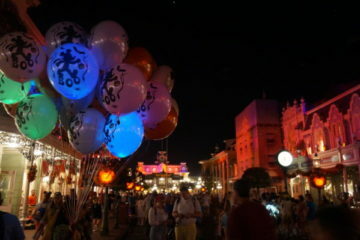 However, these ears had a special function; they could help him fly! 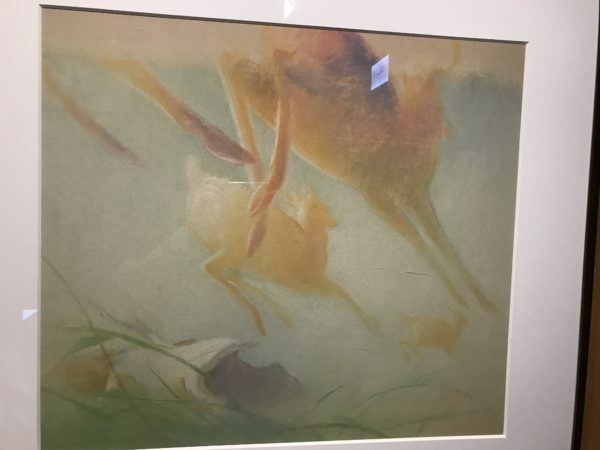 “Bambi” (1942). Concept art for the film. 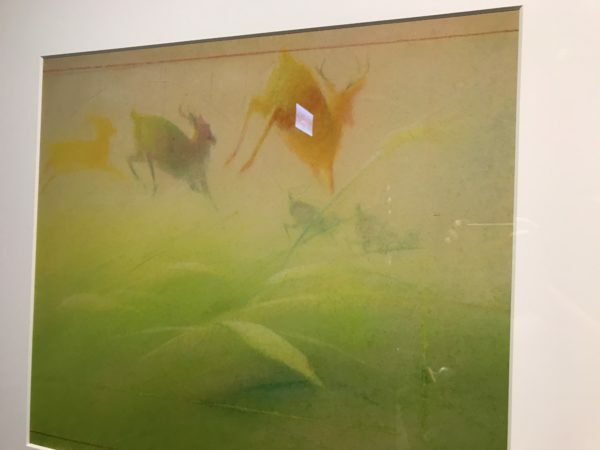 These high concept pieces represent more of the mood the film makers were after than actual compositional ideas for the final film. Bambi is a heartwarming tale about a young buck living in the woods. His father is killed by hunters, and later in his life, his mother suffers the same fate. He has some good friends though including Thumper, a rabbit, Flower, a skunk, and Faline, a doe who later becomes Bambi’s mate. 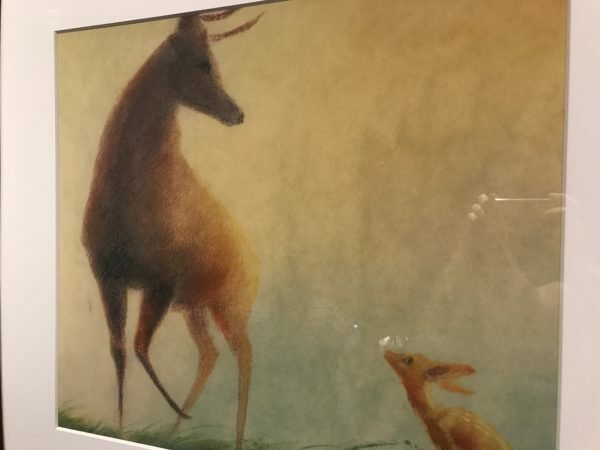 Bambi won many awards at the time, and the American Film Institute also rated his number three in the top ten animated movies of all time. It was also added to the National Film Registry of the Library of Congress. 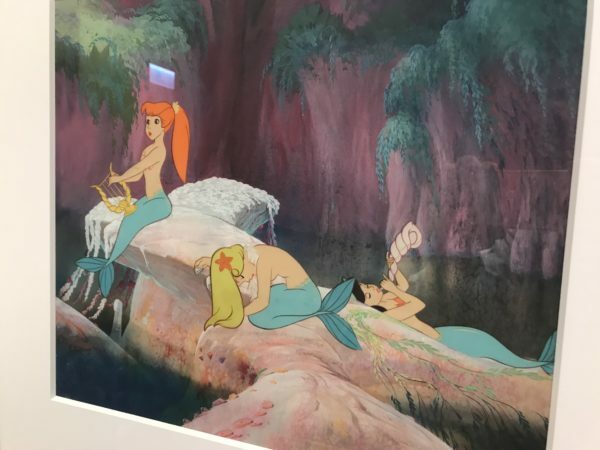 “Peter Pan” (1953). Concept art created for the film. These panels are examples of how artists experiment with many different styles when creating the look for a film. In 1953, Disney took on Peter Pan, which is based on a character from a stage show created by Scottish novelist and playwright J.M. Barrie. Peter Pan is a loveable young fellow who refuses to grow up, and he shows his friends, the Darling children, that being a child can be pretty exciting. 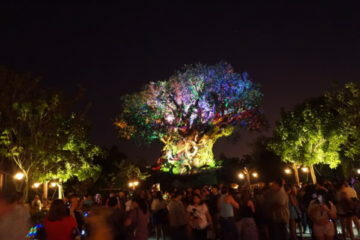 They head to Neverland where they encounter fairies, mermaids, and pirates. 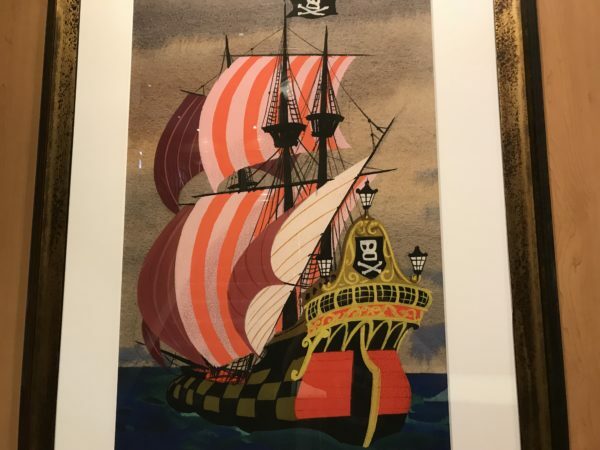 “Peter Pan” (1953). 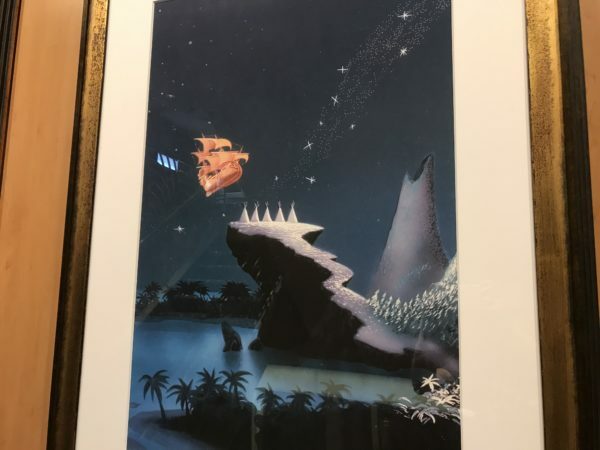 Concept art created for the film. 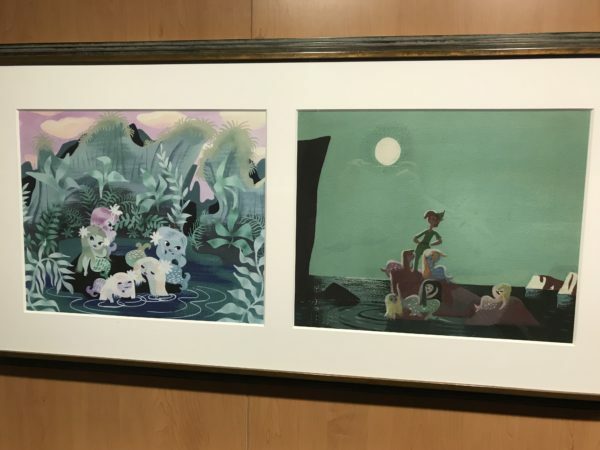 These “Day and Night” concept paintings were created to help set the look and color palette for the final film. 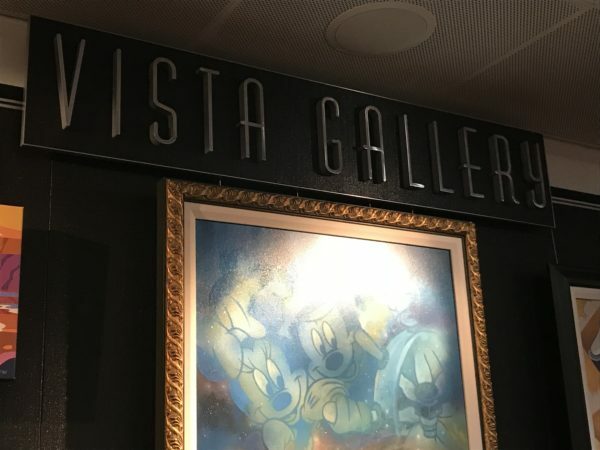 The art pictured above is scattered throughout the public areas of the ship, but the Vista Gallery, located mid-ship is a special place where you can find a concentration of beautiful Disney artwork, some of which is for sale. Prices range from an affordable $30 for a simple poster to hundreds or thousands of dollars for limited edition or one-of-a-kind pieces. 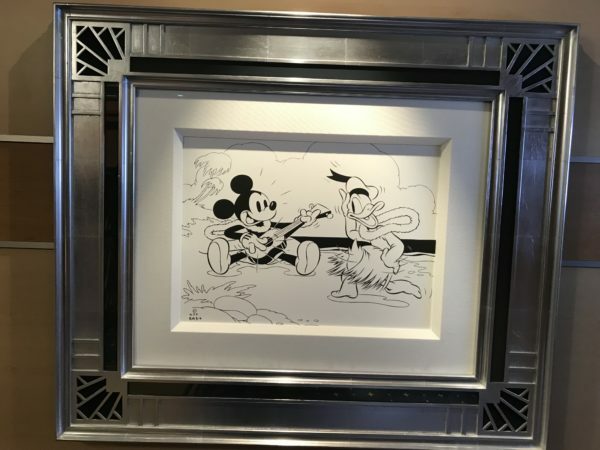 The Vista Gallery displays some special Disney artwork, some of which you can purchase! 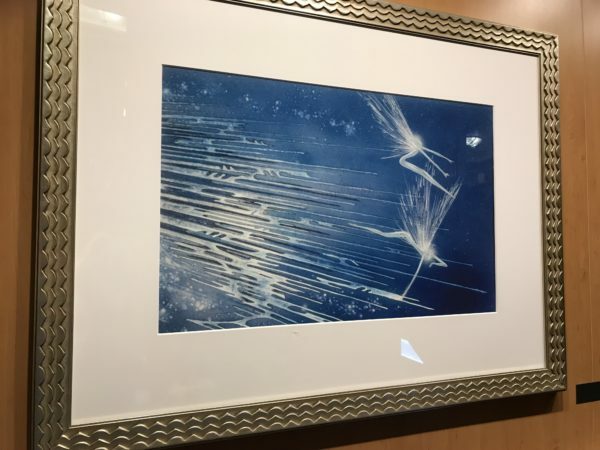 The artwork here changes frequently, but here are some things I saw during my trip. 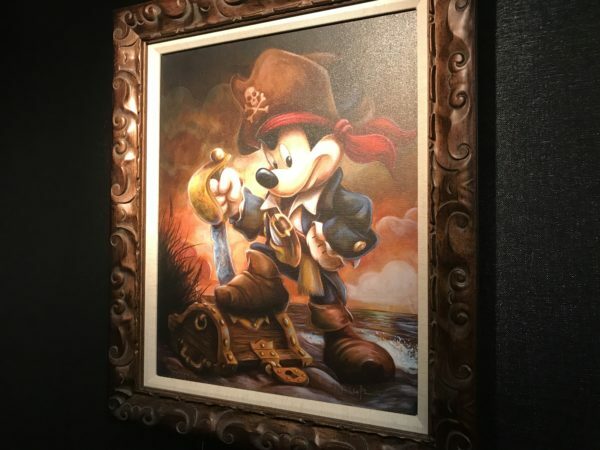 Mickey looks dashing dressed as a pirate! 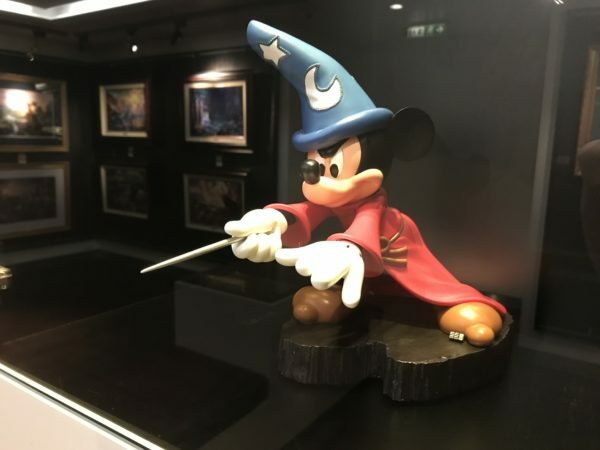 This Sorcerer Mickey statue is pretty cool! 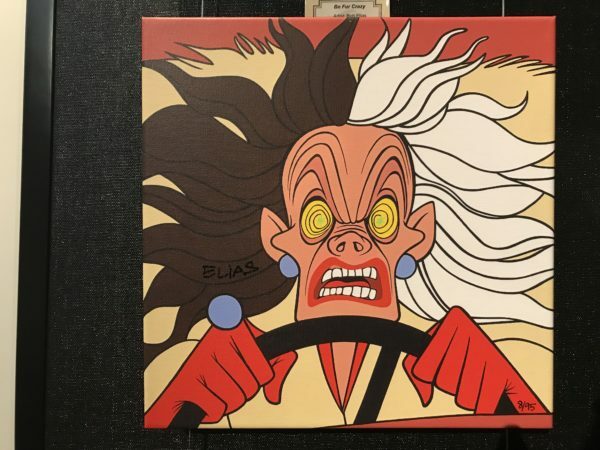 Cruella looks even scarier than normal in this piece. 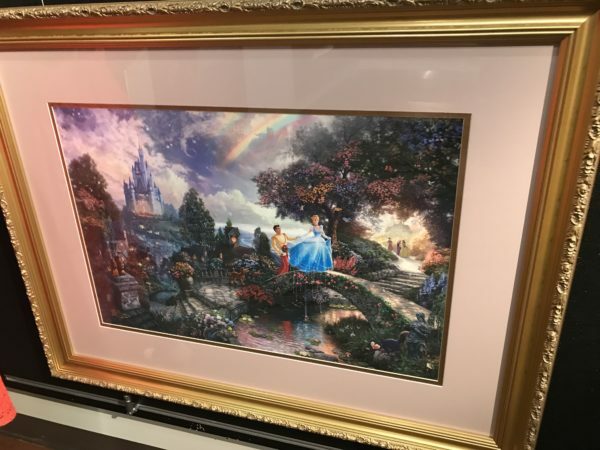 Cinderella and Prince Charming wander through a beautiful garden with the castle in the background in this beautiful painting. 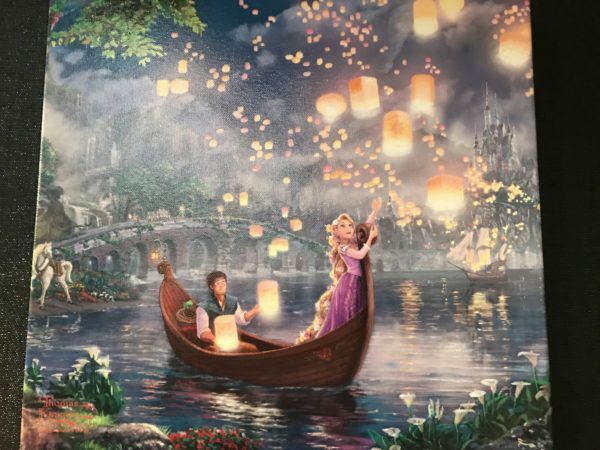 Rapunzel and Flynn Rider finally get to see the floating lanterns gleam. 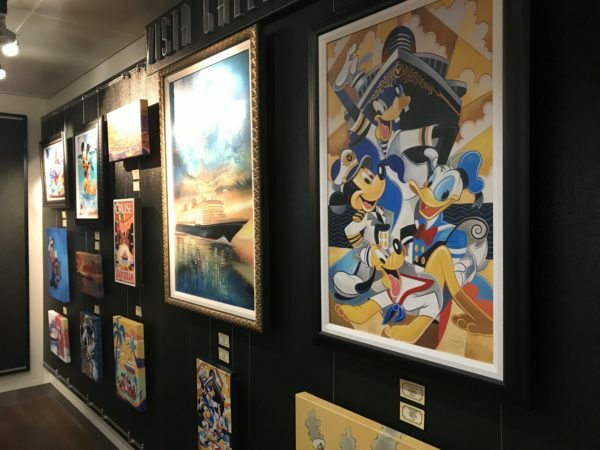 Artwork is hung in traditional gallery style. There’s a ton of variety here! 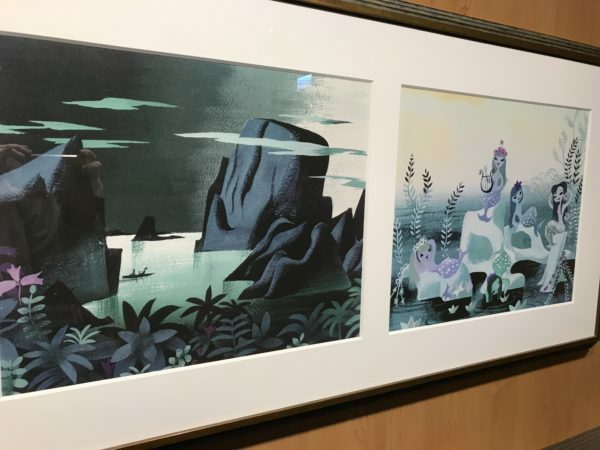 Disney art: Do you enjoy seeing, or collecting, art from Disney films?